Rufus W. Griswold, The Republican Court, or, American Society in the Days of Washington. New and rev. ed. (New York, 1856), plate opposite 183. First ed., 1855. Although Sally Foster was born to wealthy parents—her father, William Foster, was a successful merchant in Boston—she was not introduced to American “court” society until her marriage in 1790. 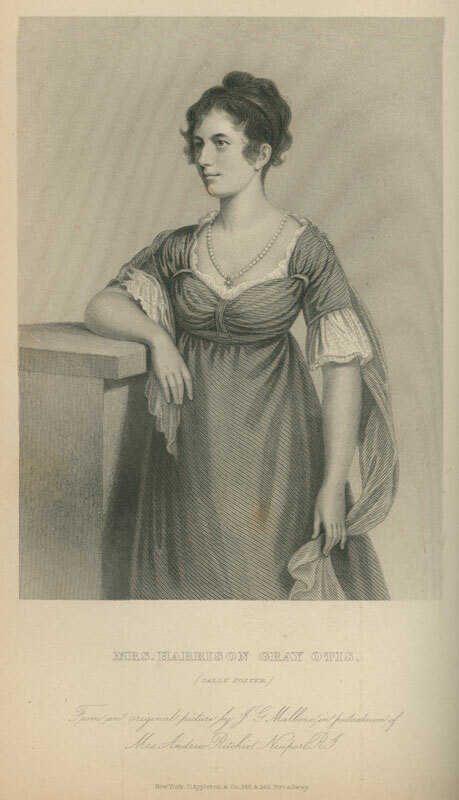 As the wife of the esteemed orator, lawyer, congressman, and businessman Harrison Gray Otis (1765-1848), Sally Foster became familiar with members of Washington’s Republican Court, attending parties and, along with her husband, acting as host to both established Bostonians and visitors to the city. 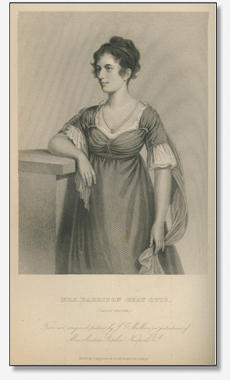 In 1797, at the beginning of Mr. Otis’s career as a representative to Congress, Sally accompanied him to Philadelphia; there, she became acquainted with William and Anne Bingham, John and Abigail Adams, and other celebrated figures. John Adams wrote in a letter to a friend: “Mrs. Otis is and always has been a charming woman.” The Otises quickly established their status among Philadelphia society; according to one historian, “the charms of the young bride and the courtly manners and winning address of her husband made them at once figures of prominence in the exclusive ‘court set’ of that day.” However, as the Otis family expanded—eventually, it would include ten children (one other child died in infancy)—Sally decided to remain at home in Boston rather than coming with him to Philadelphia. While she was not always in the company of Washington and his friends, Sally Otis was by no means cut off from the actions of the political and social circles in Philadelphia; on the contrary, her husband sent her numerous letters keeping her up-to-date with anecdotes describing events of both great and little importance. Harrison Otis’s letters to his wife provide an expansive account of life within Washington’s court. As her husband’s personal confidante, Sally was informed of practically everything that occurred in America’s political and social spheres. In those instances where she did host or meet with other American elite, she was complimented for her “beauty and wit, as well as for an intellectual vivacity [that was] tempered always by an indescribable grace.” She was also known to have a great interest in French culture, manners, and fashion, and had several dresses imported from Paris that she wore on special occasions. According to historian Samuel Morison, Sally Otis always presented herself impeccably and maintained her stately qualities up until her death in 1838. The Otises owned three mansions in Boston which were designed for them by the architect Charles Bulfinch. The earliest, built in 1796 at the foot of Beacon Hill, was modeled after William and Anne Bingham’s Mansion House in Philadelphia. Described at its construction as “the most elegant private home in America,” it is now open to the public as the Otis House Museum. Samuel Eliot Morison, Harrison Gray Otis 1765-1848: The Urbane Federalist (Boston: Houghton Mifflin Company, 1969), 193. Charles Henry Hart, “Gilbert Stuart’s Portraits of Women: Mrs. Harrison Gray Otis (Sally Foster).” The Century Illustrated Monthly Magazine 59 (1900), 24. Morison, Harrison Gray Otis, 124. The vast majority of their correspondence is still in existence today (the largest collection is housed in the Massachusetts Historical Society). See “Bibliography and Notes” of Morison’s book for specifics on these letters’ whereabouts. Rufus W. Griswold, The Republican Court, or, American Society in the Days of Washington (New York: D. Appleton and Company, 1867), 394. Morison, Harrison Gray Otis, 187. Wayne Craven, American Art: History and Culture (New York: McGraw-Hill, 2003), 118.